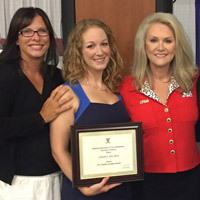 Webster University nurse anesthesia student Angela Delaria was awarded the prestigious American Association of Nurse Anesthetist’s 2015 Student Excellence Award this past weekend at the AANA annual congress held in Salt Lake City. The award is an annual honor given to a nurse anesthesia student who demonstrates excellence in an area related to leadership, scholarship or service. She began her program at Webster in 2013, and her instructors quickly took notice of her passion and dedication. "Angela is very passionate about her role as an advocate and a voice for the advanced practice nursing specialty of nurse anesthesia," said associate professor Marti Steed, who has watched her flourish in this full-time graduate program in Webster's College of Arts & Sciences. "She is hardworking, focused, and has yet to meet a challenge that she was hesitant to accept." Delaria cites teaching and guidance from faculty members like Jill Stulce and Biological Sciences chair Ron Gaddis as instrumental in her success. “I truly believe I have gotten the best possible training for my future career,” she said. Read more from Delaria's instructors and colleagues in the full story at Global Thinking.